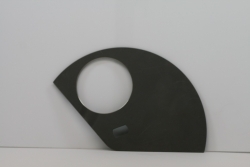 The Slide Plate is used on various Zodiac Water & Waste Aerosystems (“Zodiac”) vacuum flushing toilet assemblies. The Slide Plate is a subassembly of the Orbital Flush Valve. The Orbital Flush Valve is a subcomponent of several Zodiac vacuum flushing toilets. The Slide Plate has installation eligibility on Airbus, Boeing series aircraft, and Embraer E170 & E190 series Aircraft. Seginus Inc. has released the following FAA PMA replacement parts to aid in your cost reduction programs when maintaining your Vacuum Toilet assemblies and Galley Waste Disposal systems.